Susanne Twight-Alexander’s poems are born from her experience of growing up in California state parks, where her father was a ranger, and of frequenting the outdoors as an adult. Her deep relationship with her natural surroundings is apparent in her writings. Susy and her three brothers were influenced by their parents’ love of these parks, particularly Castle Crags State Park, where they lived for ten years. Fresh out of U.C. Berkeley with a degree in Wildlife Conservation, Susy was first published in the National Parks Magazine (now National Parks) with an essay that recounted her two consecutive years of summer employment at Crater Lake National Park as the only female seasonal ranger-naturalist on the staff. It was 1962. Her articles and photos have since been published in: Ranger Rick’s Nature Magazine, The Trinity Journal (“Forest and Meadow”), Walkabout Magazine, Inkfish, The Register-Guard, The Tribune News, and more. A portion of “Reading in Bed” appeared in High Country News. “Egrets in January” was published in the Winter 2011 edition and “Being” in the Spring 2012 edition of Groundwaters. 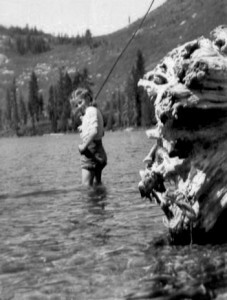 As an adult, Susy lived for 25 years in Trinity County, California where her three children were raised, and where she hiked and backpacked in the Trinity Alps, often with family but relishing solitary trips as well. She worked for several years as a Poet in the Schools in Trinity County, where she also taught elementary school for three years, including one year with five grades in a one-room school. She served as a volunteer board member on the North Coast Regional Water Quality Control Board for seven years and served a 4-year term as an elected member of the Trinity County Board of Supervisors. For a number of years the family also lived part time in a circa 1800’s log cabin on a remote homestead in the area. Born in Healdsburg, California, Susy has lived in Eugene, Oregon for over 20 years where she has worked and volunteered for a number of conservation oriented nonprofit organizations, including the local Audubon Society, in addition to serving as a member of the county parks advisory committee. At the age of 55, she completed a Masters Degree in Environmental Studies at the University of Oregon. Although her heart is in the mountains, she has come to appreciate the variety of experiences offered by living in a valley where geese fly overhead, frogs serenade from wetland ponds and the rainy weather is brightened by rainbows and spectacular sunsets. 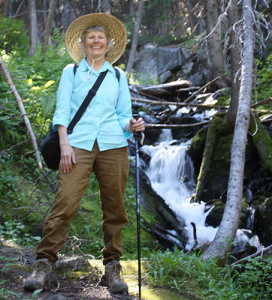 She enjoys exploring various parts of the state with her husband, from the ocean to the Cascades, and sharing local hiking experiences with grandchildren. When not hiking or writing poems Susy might be found participating in a 5K run, bird watching, biking or playing her accordion. And, if in the right spot, at the right time, in a remote corner of a wilderness, may be persuaded to yodel.